Most people use social media personally, so they’re pretty sure they know how to use it for business. These “experts” wonder, how hard can it be? Snap a photo, slap a caption on it, sprinkle in a few hashtags, and you’re done. Social media managers will attest that creating great content for a brand is not that simple, and personal use definitely won’t adequately prepare you for professional application. Speaking English doesn’t make you Shakespeare, does it? Maybe you know one of these “experts,” or maybe you are one. Good news - your personal experience using social media can make you a better social media manager, so long you know how to leverage it. This means asking yourself the right questions. In my experience, content creation is both an art and a science. The science isn’t exact - Facebook isn’t going to tell us the secret to unlocking its algorithm - but there are best practices that you can learn. Once you’ve got the basics down, you can focus on getting more creative. Social media isn't about advertising your product. It’s about personifying your brand, establishing your identity, and building relationships. Your audience turns to social media to engage socially - so as a brand, you need to be prepared to do the same. The most important thing to remember is that your content should provide value to your audience. Is this the type of post you’d pause to engage with while scrolling through your news feed? This university has the best intentions, but the post is executed poorly. The best content on social media evokes strong emotion - people are most likely to engage with a post that makes them tear up, laugh, seethe with anger, or burst with joy. Did the phrase, “complete your application,” make you burst with joy? Rather than a cut-and-dry reminder, they share a story about a student who received the scholarship last year. What obstacles did she overcome to get into college, and what dreams will she be able to achieve thanks to this scholarship? We see her photo, or maybe even a video of her telling us how hard she's worked to be where she is and how much this scholarship means to her. We laugh. We cry. We’re inspired. In the comments section, the university posts a link to the application. Draw on your own experience using social media here. Which post would you be more likely to like? I suspect most of you chose option B. I agree. The second post is emotionally engaging and inspires us to take action. Now, a real-life example from A.T. Still University. The registrar’s office proposes a post. Graduation's coming up, and the staff want to remind students to double-check their names and addresses in the university database before diplomas are mailed out. 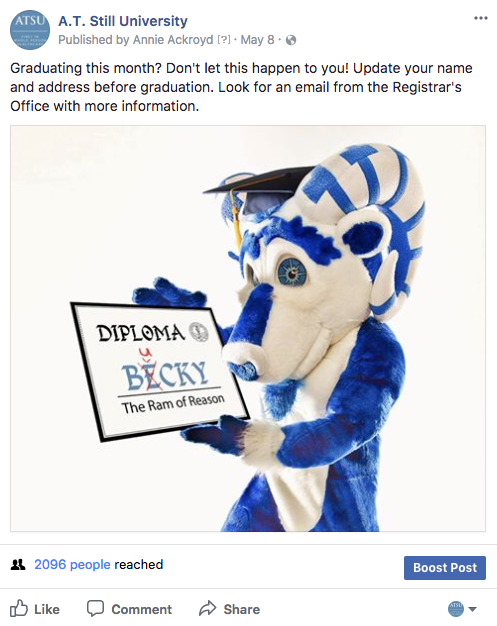 Rather than delivering a plain-text reminder, the social media team asks the right questions, and the university mascot, Bucky the Ram of Reason, gets involved. This is the result. An unfortunate typo for poor Bucky is a win for the university, as this funny, engaging post is likely to draw reactions from the right people. Being a fan, and a user of social media in your person life won't necessarily make you a great social media marketing - there's a difference between and 'enthusiast' and a 'professional'. But an interest in the medium is a good starting point, and used the right way, it can help you better understand how to communicate with a brand audience.